Food borne illnesses increase in occurrence during the summer months for a couple reasons. First, we naturally increase our activities, like weddings, picnics, graduations, cookouts and camping. These activities involve cooking outside the kitchen and in larger quantities, which in turn makes it more difficult to enforce quality control and reduce cross contamination. Secondly, nature has its own ways of increasing the likelihood of food poisoning. Bacteria are present throughout the environment, like in the soil, air, water and the bodies of people and animals, and it grows much more readily in warm, moist environments. Food borne bacteria grow fastest at temperatures between 90-110 degrees F.
The Centers for Disease Control (CDC) estimates one out of six Americans becomes ill due to food borne pathogens each year, but rest assured that the majority of people have healthy, adequate immune systems and rarely get sick from contaminated food. But to be safe, there are four basic steps you can take to make sure you’re preparing safe foods during the summer months. Wash hands and surfaces often. Unclean hands are a prime source of food borne illness. Always wash hands when possible with warm, soapy water after using the bathroom or changing a diaper and before handling food and after handling pets. When eating away from home, check for a clean source of water. If none exists, be sure to bring some with you for preparation and cleaning. 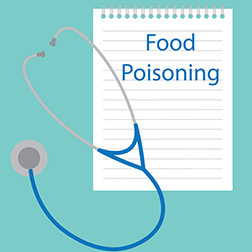 Cross-contamination during preparation, cooking and serving food is another cause of food borne illness. Be sure to keep all raw meats carefully sealed in a cooler before cooking. You want to make sure the meat and its juices do not come into contact with ready-to-eat foods. Remember to clean and wash all utensils, plates and cutting boards that held raw meat before using them again to cook the food. Take a thermometer along and check meats to ensure proper internal temperature. Cook hamburger or other ground meat (veal, lamb and pork) to a temperature of 160°F. Cook ground poultry to 165°F. Cook steaks or roasts that have been tenderized, boned or rolled to a temperature of 160°F for medium and 170°F for well-done. Whole steaks and roasts may be cooked to 145°F for medium rare doneness. Whole poultry thigh cuts should be cooked to 180°F. Breast meat should be cooked to 170°F. Refrigerate all foods promptly. Keep hot food hot and cold food cold. Consider packing canned beverages in a separate cooler from perishable food since the beverage cooler will likely be opened frequently. Keep coolers in the shade or coolest part of car, and replenish its ice supply frequently. Never leave food out more than two hours when the outdoor temperature is below 90°F. If temperatures are above 90°F, never leave foods out more than one hour.